Lipolytic, Finessence Organic Cedar Wood Morocco Essential Oil is generally used to fight against cellulite. It is ideal as a natural asset in slimming care! Thanks to its anti-inflammatory properties, it works wonders in case of heavy legs and varicose veins. It is also recommended to stop hair loss. Purifying, it eliminates dandruff and tones the scalp, to the delight of fat hair. Its delicate fragrance creates a woody atmosphere and invites to meditation. 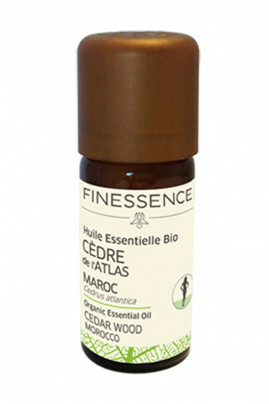 The Finessence Organic Cedar Wood Morocco Essential Oil is a versatile and natural asset! Cutaneous application: In a spoonful of organic vegetable oil, add 4 drops of essential oil and apply to the affected area. Infusion: Add 3 to 4 drops to a piece of sugar or a spoonful of honey. Mix in one liter of lukewarm water. Atmospheric diffusion: For dosage and diffusion time, follow the instructions for your essential oil dispenser. - Do not use in children under 7 years. - Do not use in cases of moral depression or asthenia. - Do not use in people allergic to essential oils. - Consult a doctor for any therapeutic indication or any oral treatment. - Never inject essential oils intravenously or intramuscularly and do not associate them with medication without oral medical advice. - In case of doubts or questions, do not hesitate to ask your house for advice. - Do not leave vials of essential oils within reach of children. Recommended storage for the direct consumption of essential oils, in particular infusion is two years. For any other use, essential oils are still effective after five or six years. Cedar Essential Oil is organic! Cedrus atlantica (cedar) bark oil. Dangerous. Comply with precautions for use. May be fatal if swallowed and enters airways. Toxic to aquatic life with long lasting effects.